Nintendo, with their assorted versions of the DS console, have dominated handheld gaming for years. Since the introduction a few years back of the PSP, Sony has tried to compete in the on-the-go-gaming market, too, but with limited success. Here’s a look at Sony’s spanking new PS Vita, a handheld that aims to change that. 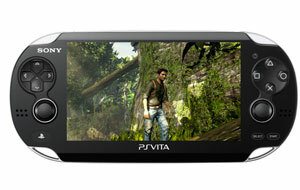 The PlayStation Vita sports a gorgeous, 5-inch, 960 x 544 OLED display. The touchscreen renders rich color, with deep blacks and sharp textures. Besides finger input, users will rely on the primary gaming controls: a classic D-pad on the left, and the traditional PlayStation triangle, circle, square and X buttons on the right. The PS Vita is also the first handheld to incorporate dual thumbsticks. Further, the rear of the device is a touch sensitive pad, so you can run a finger across the back in certain games, triggering an on-screen response. Finally, there are front and rear-facing VGA cameras (both modest 640 x 480 resolution). These will come into play particularly in augmented reality gaming, in which game elements are added atop real video or photos. In all, the controls are responsive and tight, and many of the games take advantage of both touch and traditional, in some cases giving the player a choice. Any self-respecting gamer will tell you that it’s not about graphics, quad core processors and slick control schemes that make a great platform. It’s the games. And in this department, the Sony Vita delivers with a stellar launch lineup. First, there’s a terrific Vita version of their flagship UNCHARTED series, with “Golden Abyss.” Also available at launch, the impressive “wipeout: 2048,” and “Little Deviants” for younger players. 3rd party publishers are all in, too. Off the bat, there are great titles from EA (“FIFA Soccer”), Capcom (“Ultimate Marvel vs. Capcom 3”), UbiSoft (“Rayman Origins”), and Namco Bandai (“Touch My Katamari”). What’s more, there are literally hundreds of titles for the earlier, Sony PSP available to download directly to the Vita, though not every game in the PSP library is compatible, so purchase with caution. Note that some games even support PS Vita play against others on the PS3, so you’re quite literally taking your game with you from the livingroom. There is, of course, a web browser and apps for Twitter and Facebook. All data from the Playstation Network (friends, gamer info, etc) is available on the Vita, as well. Users can also use Skype, Flickr and Netflix. There’s further support to download music, movies and TV from the Playstation Store. It’s a fantastic media device, to be sure. And with access to the web and messaging, parents can set controls accordingly, blocking sites, browser use, and purchases. With millions of households owning Nintendo DS handheld gaming devices, and even more with smartphones and iPads with solid game options, nobody really needs another gizmo to play on. And the Vita, is hardly a toy. it packs the processing wallop of the full-sized PS3 mothership. But if you’re a serious gamer (especially one with a PS3), or just someone who covets the newest, shiniest object out there, this won’t disappoint. 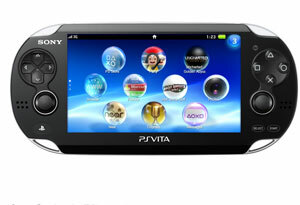 Be prepared, however, to pay a steep admission price into the club; the Vita starts at $249 or the WiFi version. A WiFi and 3G model with AT&T service, will set you back $299. Can you use skype over the 3g network to make calls to other phone numbers?